The second week of adult co-ed flag football action on the Island took place last Thursday now that the adult soccer finally came to a close last week. Gulfview Windows, a new sponsor in the league represented by a veteran team led by Ryan Moss, took the field by storm against Hashmark Sports. Young new team captain Tim Holly for Hashmark Sports started his team on offense in the second game of the night. Moss quickly showed the members of the Hashmark Sports team how things are done in the adult league with an interception on the first snap of the ball. The pick-six put Gulfview Windows in the early lead. Missing the point after, Moss’s team once again took the defensive field position. Hashmark Sports Joey Carder gained short yardage on first down. On third down, Moss grabbed the pass and took it to the end zone. Going for two points, Tyler Lancaster returned to the league with a nice catch for the two-point conversion and 14-point lead for Gulfview Windows. Taking the field with possession of the football, Hashmark Sports answered back with a bomb to Chris Smith and touchdown by Carder. Jordan DeMers became Moss’ favorite go-to guy in the game reception with a long run to score six points. Going for two points, Moss was diligently chased by Carder causing the incomplete pass. Claudia Perez had her first reception opportunity in the game, but the Hashmark Sports quarterback could not quite get the ball to her hands. 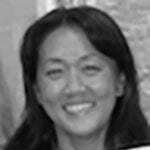 Her team gained a critical first down on second down and took advantage of the momentum taking the football downtown for another touchdown. Both teams had unsuccessful offensive series until the scoreboard showed 55 seconds left in the half. Lancaster made a first down reception that set up another long ball to DeMers and touchdown. With the score 26-12, Holly sacked Moss on the point after attempt. The quick effort by Holly’s team came up short as Gulfview Windows’ Joe Ball knocked down the ball right in front of the intended receiver to end the half. The last 25 minutes of the game started with a touchdown catch by Lancaster, followed by an extra point, advancing the score to 33-12. Three snaps and out for Hashmark Sports gave the football back to Gulfview Windows. The DeMers-Moss combination gave their team another touchdown and two-point conversion with an on the run pass by Moss to Lancaster. With a 30-point lead, the Gulfview defense could not rush the Hashmark quarterback Matteo Ferris. After an incomplete pass, Ferris hit his receiver with a bomb, putting him into the end zone, shrinking the point spread to 24 points. Moss’s next target was Eliza Faillace. The pass was long and out of the reach of the soccer powerhouse. A turnover by Gulfview Windows gave Hashmark a scoring opportunity. With the extra point, the score moved to 42-24, keeping the game open for anyone to win. The first play in the Gulfview series allowed Moss to run the football all the way to the end of the field, putting six more points on the board. After the Perez reception and Faillace flag pull, DeMers made an interception. Stopping another touchdown, Holly chased the Gulfview Windows game MVP to prevent another score. Ed Moss made the next catch of the night with the stop by Smith. The rolling game clock sparked a strong defensive effort by Hashmark Sports. Ferris sacked R. Moss on third down to put the football back into his team’s hands. Trying to close the gap before the end of the game, Ferris hit Smith for yardage and then threw an uncatchable pass to Carder. In the final end zone toss-up, Gulfview Window’s Ball knocked down the football to end the game. Thursday night, Gulfview Windows faces Ray Gardner’s Progressive Cabinetry at 6:30 p.m. In the second game of the night, Hashmark Sports goes against Tim Shaughnessy’s Lancaster Design team. 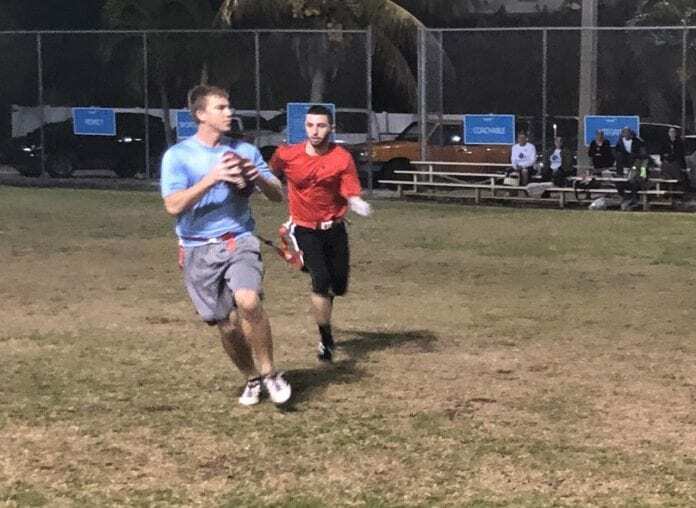 The late game puts Team Ugly Grouper, lead by Charles Buky, on the field with Beach House Real Estate in the third week of flag football action at The Center.